Sleep Well Essential Oil Blend diluted in Massage Base (ready to apply). Sleep Well is compounded with nature's most calming and softly fragrant essential oils. Premixed in our Massage Base. Use directly from from bottle for soothing massage or add a cap full to a warm bath before bed. 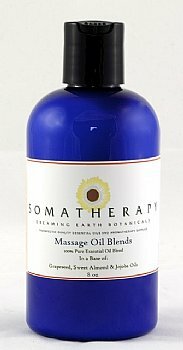 A blend of 100% pure Essential Oils: Roman Chamomile, Lavender, Marjoram, Sweet Orange, Tangerine and Ylang Ylang in our Massage Base (a combination of Sweet Almond, Grapeseed & Jojoba oils). Review: Best stuff ever, not oily, absorbs into my skin and does not leave any residue on linens. After a long day I massage this into my neck and on my arms and the light fragrance wraps around me and I fall asleep like a baby.